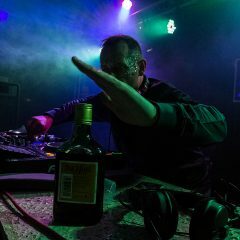 Steven Flynn has been in amongst the Highland Club Scene for over 2 decades now, In the early days he could always be found by the Dj booth, watching and learning from his peers, gaining his dance music education from the local Dj’s that back then played every single weekend. . He took to the 1210s himself in 1996, putting on his own small nights at first before quickly establishing himself amongst his Peers. He became well known throughout the Highland clubscene within the space of a couple of years due to his refreshing Tribal Techno sound and energetic performances while in the booth, regularly guesting at biggest venues & Club nights from Thurso, throughout the west coast down to Inverness & Elgin. Flynn has the distinction of being one of the Rotating Residents for local club night Infatuation in the late 1990s, legendary Highland Club Jungle Palace in the early 00’s, Club Robotone Inverness then onto his current Residencie at Audiolife. Flynn regularly produces mixes for his Mixcloud page. He is renowned for his all out pumping techno sets but he is just as at home, mixing melodics to tech house. He is now honing his production skills and alongside fellow Audiolife stablemate Alan Macpherson looks to have some releases available by the end of this year. This will be Flynn’s 2nd outing at Shenanagins following last years blistering set.